Come out and join a supportive and welcoming group of ladies whether you are just getting into riding or looking for a little more of a challenge! 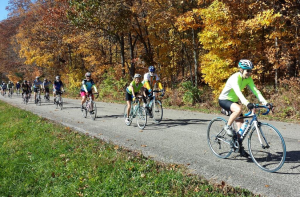 The Wabash River Cycle Club is an active road- and gravel-road cycling group that sponsors about 20 rides a week, and a few more that appear as pop-up ride announced on the club website, during the warm months of the year. Weekday evenings and weekend rides for riders of every persuasion from beginners to hammer heads. This is a great resource for cyclists of every ability and degree of experience to be able to go on scenic, well-planned rides that cover swaths of Tippecanoe and surrounding counties starting from various venues (particularly popular starting points are Kalberer Soccer Fields, Klondike Library, and Celery Bog in West Lafayette and Mayflower Mill school in Lafayette). We treat the entire Wabash and Wildcat river drainages (not to mention the cornfields) as our playground. Come enjoy our area by bike! You’ll never think of it as flat or boring again, and you’ll make friends and buddies to ride with. Check out the possibilities on the club webpage, http://wrcc-in.org/wp/calendar/, where starting points are described in detail. 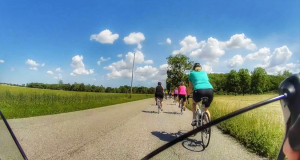 Celebrating 41 years of cycling along the Wabash River Corridor, the Wabash River Ride commences on August 24th, 2019 from 7 am to 5 pm. 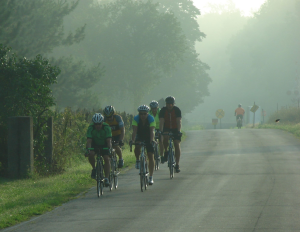 Join cyclists of all levels for well-organized and supported routes of 34, 47, 65 or 107 miles through Tippecanoe, Fountain and Warren counties. Along the routes are scenes rarely thought of when considering North-Central Indiana’s landscape: views along the Wabash River and Big Pine Creek, iconic landmarks such as the Fountain County Church, Rob Roy Covered Bridge and historic Williamsport Bridge, and rolling hills around the river valleys that make for a fun and challenging century. Visit their website for ride info.